Live, Breath, and See the Las Vegas experience! What is more interesting on earth than America’s Sin City? The answer? Not much! If you’re here then you’re likely looking for something to do while you’re on vacation in Las Vegas. There are many events and shows to choose from – the best and most creative entertainers in the industry are housed here of all places. From breath taking acrobatics to more simplistic pleasures; Vegas has it all. There are so many things to do, and many things to see when you’re in the heart of sensory stimulation. I have compiled this article to give you the top experiences Vegas has to offer. So what is there to do in Vegas? As if it had to be said – Absinthe is an adult show described as a ‘raunchy and comedic circus performance’. Not for the faint of heart the show is performed by many-a burlesque dancers. ‘The Gazillionare’ is the ring leader of this mad house bent on the humiliation of his onlookers. Astounded or shocked you might not make it out of this show without being specially selected by the circus, Absinthe, herself. The show is full of amazing spectacles from the attractive female performers to the death defying stunts; you’re sure to remember a show like this! I’ve personally had the pleasure of seeing this life changing performance. Each and every performance is unique in one way or another – world class gymnastic entertainers all join together to put on a show that is extremely mystifying. The show could be described as an artistic masterpiece; the characters are whimsical and quirky – the story however, is much more mysterious. The characters will playfully engage the audience, and provide spectacular theatrical displays of talent and skill. Aerial acrobatics are simply gut clenching. Watch as the characters free-fall from a hundred feet up and gleefully rebound only to disappear mysteriously into the background. Perhaps you want something a little more… naughty? Magic Mike is a Live performance brought to you by Channing Tatum; That’s right, the actor. This show is one of the most affordable in Vegas and the price is well below the talent, and experience that drives this show. With the hottest and most exotic male dancers from around the world, in the world – call this place home. The entire audience is a part of this performance as the dancers tease and lead the crowd on all night. Will you die of embarrassment? Will your heart beat out of your chest? Only the night will tell! Takes your heels off and stay a while. An all time favorite of Las Vegas is this silent and mysteriously curious group of blue men. These silent musicians put on an unforgettable display of musical talent with unique and bizarre instruments, effects, and physical dialogue. The most unique on this list for it’s Kids friendly performance (just in case you couldn’t find that babysitter). Children and adults of all ages will enjoy this show for being extensively expressive and creative beyond anything you’ve ever seen before. A word of warning though the Blue Man Group has been known to deviously incorporate instruments that make a splash! So if you absolutely have to bring the kids this is the show for you and the family. 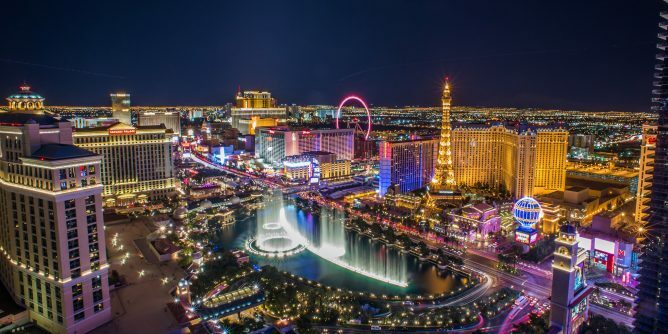 No matter what you may be at Vegas for there are plenty of things to do, and see while you’re staying at one of The Strip’s world famous hotels and casinos. From heart pounding gymnastic performances and lights; to the most exotic dancers. Las Vegas is home of the mysterious and provocative. For a night filled with fun, lights, drinking, music, and entertainment; Vegas has it all! Don’t miss out on the most interesting and memorable experiences Vegas has to offer – purchase tickets online now while they are available.